Cyclesnack: A 29er on the Hartford Craigslist? 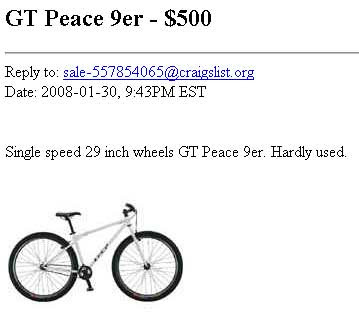 Check out the write up on TwentynineInches.com: GT Peace 9er and true to CList pricing standards the $500 price tag is 9% under MSRP, with tax, you are saving 15%. The seller doesn't say OBO so it sounds like he might not be willing to part with it for less than $500 but you never know. Haven't seen this bike for sale on Bikerag, Crankfire or Bustedspoke so clearly he isn't trying to sell this hard enough. Some missing information, which is the most important is the frame sizing. Was gonna keep this bad boy but not a viable option right now. This is my new 29R single speed. Never seen dirt. Never seen any action actually. The disc brakes are not Avid BB7s, if you are going to get mechanicals, then Avids are the best and the rest of the components are OK I suppose but the important example is the price differential. This bike hasn't seen dirt, looks like it in the pictures, where the other one has. If you could get a 2007 between $400 and $450 then I would think you are getting a good deal. The funny thing about pricing on Craigslist is figuring out the true worth of the bike. I like to go to eBay to see if I can find what the market value of a used bike or nearly used bike would be before trying to sell my own or buy something from CL. $375 and a buy it now. Looks like a new bike and with shipping you are looking at $445. And there are two others where the reserve hasn't been met but the first one I think is probably the best judge of what the market is willing to pay for this bike.